In order to master our pour-over technique, we reached out to our friends at Blue Bottle Coffee who use this brewing method at all of the shop’s cafés (40-plus and counting). In case you didn’t know, this manual method requires a kettle and a dripper, although it’s done slightly differently depending on where you go. 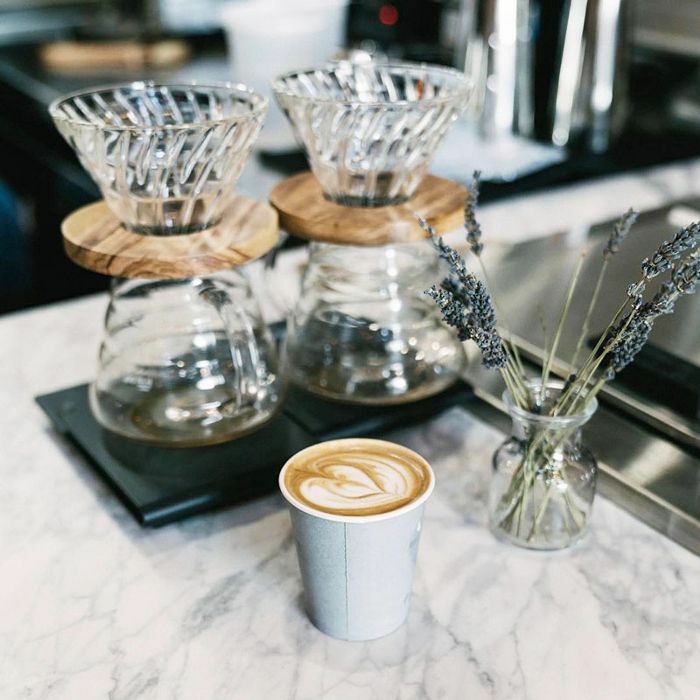 “One of the first coffee books I ever read had a line in it about how starting your day with a perfect cup of coffee was one of the best gifts you could give yourself,” says Michael Phillips, Blue Bottle Coffee’s training director. Well, when we heard pour-over coffee being compared to meditation, we decided we needed to learn the craft. Below see Phillips’s expert tips for how to make Blue Bottle’s signature pour-over coffee at home. Read through to see our step-by-step guide. Place a dripper on a cup or carafe—whichever you want to brew directly into. Put a filter into the dripper, and wet it before you put the coffee grinds in. “Filters can leave some element of a papery taste and pre-wetting can inhibit that,” says Phillips. If you want to save time, Blue Bottle Coffee has developed a filter for its specific dripper that doesn’t need to be pre-wet. Put your favorite coffee grounds into the filter (Blue Bottle’s Perfectly Ground envelope will have the pre-measured amount you’ll need for brewing in case you want to save some time). Make sure to even out the level of grounds, as you would flour in a measuring cup while baking. Pro tip: Getting the coffee ground at the right setting will get the optimal amount of flavor out of the beans. “If it tastes bitter, you are grinding too fine, and if it tastes sour, you are grinding too coarse,” Phillips notes. Pour around 1/4 of the boiled water over the coffee grounds with a swan neck kettle (the kettle gives you control of the water and helps with even saturation to give the coffee more flavor). Begin your pour at the outer rim, and move inward in a spiral toward the center (you want to be sure the grounds are all saturated with this one pour). Although it may seem complicated, stick with it; it may take you a few tries to get your pours right. “The actual pouring technique and the brewing process can be mastered by anyone willing to pay attention to the details and put in a little practice,” says Phillips. Once the water has made contact with the coffee, let it rest a bit (for 30 to 45 seconds) so that the gases can be pushed out (they inhibit the extraction process involved in making coffee). What’s happening now is called “the bloom” because of how it reacts visually—the coffee will expand as the water comes into contact. “It forms a dome-like shape like the texture of a rising brownie batter cooking in the oven,” says Phillips. At this point, the coffee is brewing. Finish the process by pouring the remaining hot water over the coffee in about two to three equal parts. Make sure to take breaks between each pour so the coffee can drip (look for the waterline to drop about a thumb’s width before you continue to add water). You want to begin in the center, move to the outer edges, and then go back toward the middle of the grounds (this “stirs” the coffee and helps with the coffee’s extraction). Have you ever had a cup of pour-over coffee? If so, how did you like the taste? Share with us in the comments. Up next, high-protein, low-carb snacks for when you’re on the go.